Heavy Metal Yoga: sounds like a bit of paradox? But for those well accustomed with the genre it might not come as a surprise that these two seemingly different worlds can coincide. “I was looking around for events at places with anything guitar based all around town. Looked and I saw Heavy Metal Yoga. I’m thinking: okay, this I just have to try out! Just based purely on the name,” said Adam, a participant. The class takes place every Saturday at the Black Heart, a heavy metal pub tucked away in a narrow side lane close to Camden Town. It is the kind of music venue you would expect to find in Camden, however, on this occasion people coming through the doors are not looking for a drink. They pass the bar and walk up a flight of wooden stairs. 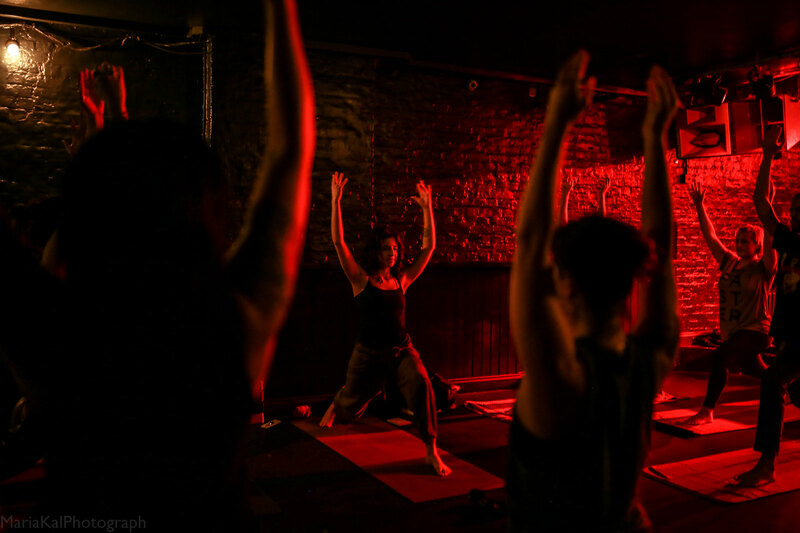 The upstairs room is dark and dimly lit with red lights with pink yoga mats on the black floor. For someone who is not too familiar with heavy metal, they might perhaps expect something like Blackened screamo. However as ambient music fills the room, there is quite a different vibe. More participants also said the same things. “It’s good to have the physical and the mental release at the same time,” according to Hannah. “I like having the scene, I like having the tone. I think it sets a nice environment,” affirmed Toby.